ST. PETERSBURG, Fla. November 13, 2018 — California’s catastrophic wildfires are threatening the homes of over 13 million residents and forcing evacuations in major metropolitan areas. With high winds expected to worsen the fires this week, travelers may be concerned about upcoming trips, especially with the Thanksgiving holiday just a week away. 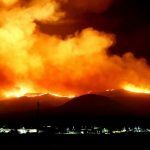 Travel insurance comparison site, Squaremouth, explains 3 ways travel insurance can help travelers impacted by the fires. Travelers headed to wildfire affected areas may be covered by their travel insurance policy to cancel their trip and be paid back for their non-refundable trip costs if their hotel is rendered uninhabitable. Most policies with the Trip Cancellation benefit also include coverage if the city listed on their itinerary is under a mandatory evacuation due to spreading flames, smoke or other reasons determined by local authorities. Travelers who are already at their destination can be covered to cancel the remainder of their trip and return home early if wildfires cause them to be evacuated to a safe location. Trip Interruption can cover between 100% and 200% of a traveler’s trip costs, as well as transportation expenses for travel back home. A record 6.8 million California residents are expected to travel for Thanksgiving this year, according to AAA Travel. If a resident’s home is damaged by the fast-spreading wildfires, many travel insurance policies can refund their trip costs if they need to cancel their trip to return home. The home must be rendered uninhabitable in order for travelers to be reimbursed to cancel their trip because their home is damaged. Squaremouth’s California Wildfires Travel Insurance Information Center explains travel insurance coverage with up-to-date information for travelers affected by the fires, including answers to FAQs and statements from providers.